Field Agent Robert Diggs walked away from his career in the FBI and accepted the position of Cultural Attaché in Sofia, Bulgaria for one reason: to escape the memories of his wife’s death for which he blames himself. However, when an unknown vigilante begins killing high-priority terrorists from America’s Most Wanted list, the FBI and CIA request he takes on the case. 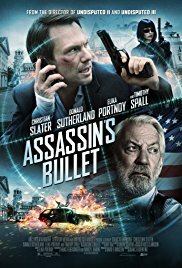 Christian Slater and Donald Sutherland in the same movie … that couldn’t be bad. It was worse than bad. What a terrible B-movie this was. For those who want to learn belly dancing, buy that movie. There’s plenty of tutorials in. There are also some really ridiculous blunders: a VHS tape that catches fire after being thrown into boiling water. A teacher who exposes half her buttocks showing a tattoo there. Afterwards she appears to be the belly dancer, but where did that tattoo go? I had a flashback into the ’80s when you could rent such crap movies by the hundreds at your local VHS rental store.